Brrr, it was a nippy morning! Just a bit of a breeze, but cold and in the low 30s. We were excited to have our first real town day and zero just 13mi away and got going at 6:30am. We soon separated when Katherine took a pit stop to find water just off trail at a spring. I was good with water and headed on through Poison Spring Canyon. 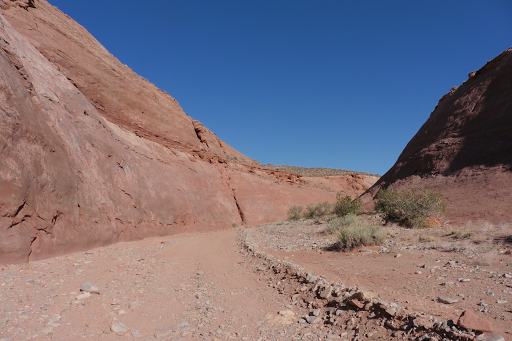 It was a great canyon that wound with mostly packed dirt road for good walking. As I got closer to Hwy 95, I could see the Henrys, which we will go over the two days after Hanksville. It is the last mapped mountain range in the continental US and we will go over the highest peak, Mt Ellen for our highpoint on the Hayduke over 11,000ft. Exciting! I hit the road at 10:45am…13mi before 11am, yep I was motivated! We had heard that although it’s a major highway, the hitch could take hours to get, so I was prepared to wait…four minutes later the first car drove by…and picked me up! 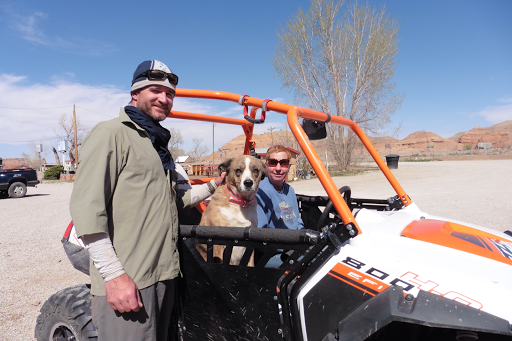 Thanks to day hikers Eric and Laura who went out of their way to drop me in Hanksville! 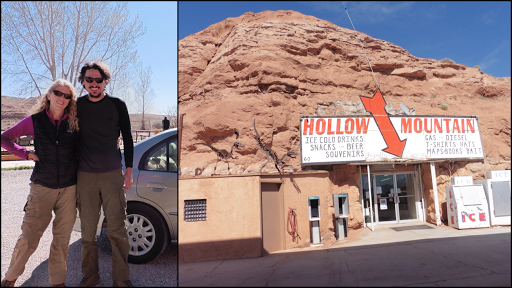 Hanksville is pretty much a one mile strip (if that) with quite the tiny community. There are two hotels, three gas stations, a burger place, a steakhouse place, a post office, and a grocery store. Since it is Easter weekend, we seem to have lucked out and everything is unusually stocked in town. Check out this cool gas station that is in the rock! Everyone in town seems to be related in some form and all are sooo kind! I think most the businesses are owned by the same person pretty much too. I had to go to the Post Office to pick something up unexpectedly and was lucky to make it there before it closed at noon. I remembered that Gavin had boxes there that he figured he’d have to get in two days on Monday and asked her if there was any way I could get them for him. She couldn’t release the boxes, but did give me her number (of course she lived right down the street) and took the boxes home saying she’d bring them to Gavin if he called. Gavin showed up later in the afternoon after sadly trying for over 2.5hrs to hitch. Katherine had hers within 10mins. So lucky to be a girl when hitching! Gaving called Kristina, the postwoman, and she arrived at the hotel almost immediately in her four wheeler (like many in town! ), dog in tow, and a smile on her face. What a great community! When we arrived, we got to meet another Hayduker we knew that started a few days ahead of us. His name is Freebird and we had emailed a bit before trail. He was headed back out to trail and will again be a couple days ahead of us, but stayed and ate lunch with us so we could catch up. We were in food comas and I totally forgot to get a photo, but I’m sure we’ll see Freebird again up trail. We are staying at the Hanksville Inn tonight since we came in a day early and the nicer hotel, the Whispering Sands was booked. We have reservations there tomorrow and will probably move over there to keep out commitment and the internet is better. The owner of the Hanksville Inn has gone out of his way to make us feel welcome and we wish the wifi was better so we could stay cause he’s been such a great host! Thanks to Ed for being so awesome! So the bummer about Hanksville is that phones don’t work here, gasp! Apparently, if we drive 50mi and get a Verizon signal and then come here, it might work…and supposedly AT&T works. Sprint doesn’t. The other bummer, which is common on the Hayduke, is that the wifi is suuuppper sloooww. I went to every hotel and business and got the scoop that one of the gas stations had the best wifi. 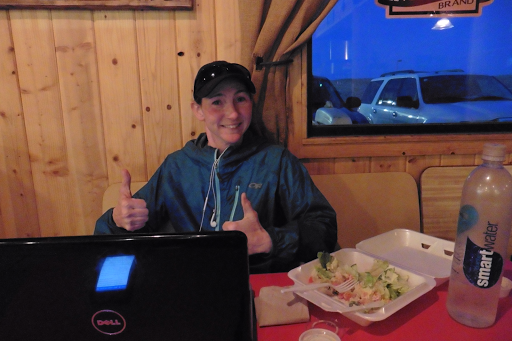 Thanks to the owner, I got to camp out at a booth for the second half of the day and get the blogs posted I had stored up. Tomorrow, I’ll probably be here most of the day too. I’ve even kept a tab of things I bought to make it worth their while. Whew, close one as I almost couldn’t post. Tomorrow I attack the two weeks of emails that piled up. I’m ready for my ZERO!!! !